For the first time in quite a while, I haven’t been putting on my enormous down jacket (it looks more like a comforter than a coat…stylish) in the morning. These are very exciting times — the thermostat will even be hitting the mid 70s (!!) in NYC this week. So, it seemed like a cold chicken dish was in order. 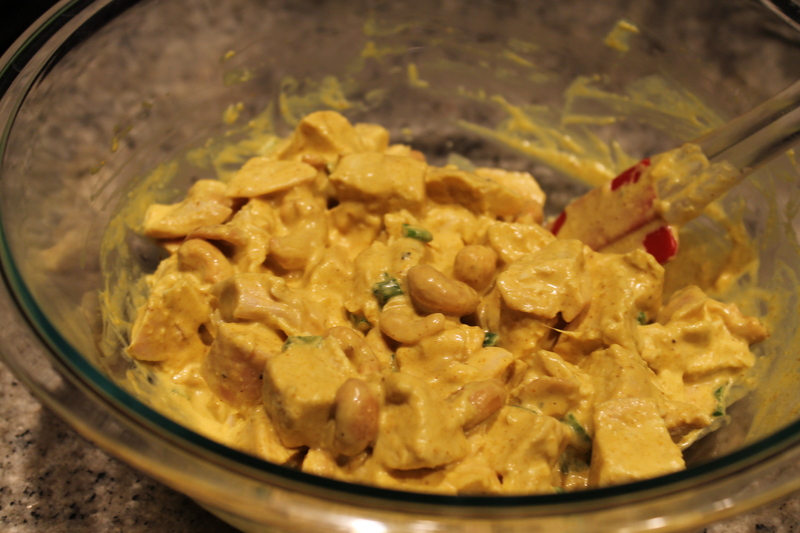 And what better way to (literally) spice up a classic chicken salad recipe than with some curry… and a healthy twist! I was inspired by Ina Garten’s curried chicken salad recipe, but swapped out the majority of the mayonnaise for non-fat Greek yogurt (for those of us realizing a bit too late that we will have to wear shorts & skirts in the very near future). You are also welcome to add celery and/or raisins to this recipe, I happen to think raisins are absolutely disgusting but that is just my opinion! 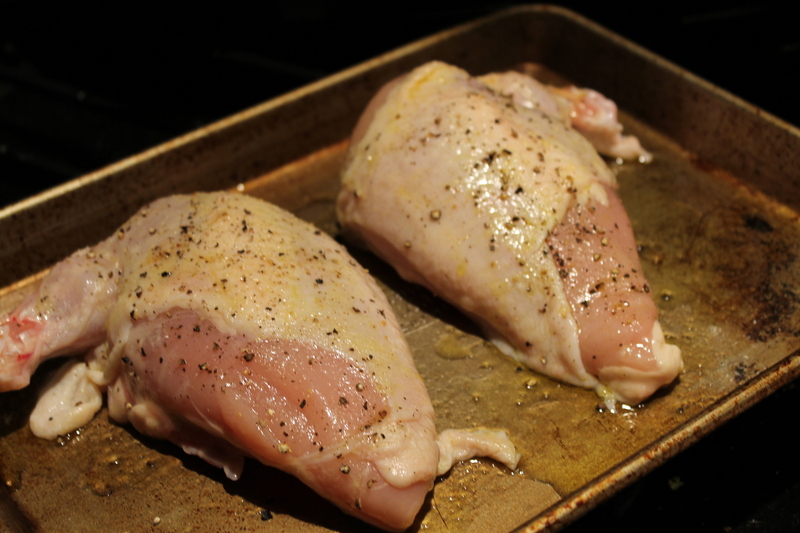 Preheat your oven to 350, drizzle some olive oil over the chicken breasts and season with salt & pepper. Roast them for 35-50 minutes until they are fully cooked (cooking time will depend on the size of the chicken). While the chicken is roasting, make the sauce. 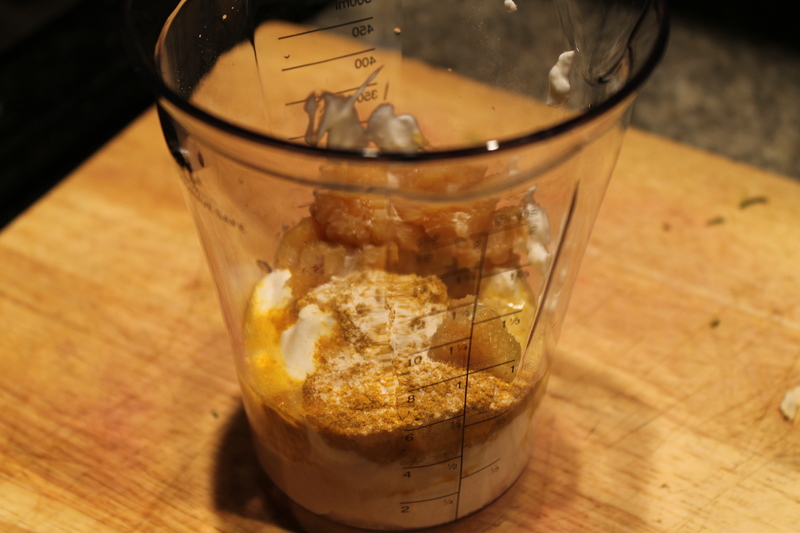 Combine the yogurt, mayo, chutney, curry powder, white wine vinegar, and 1/2 tsp salt in the bowl of a food processor OR in a small bowl/immersion blender mixing cup (if you have an immersion blender). Blend until uniform and set aside. As soon as the chicken is cool enough to handle, remove the skin and dice into nice chicken salad sized pieces, about 1/2″ squares but you don’t have to be exact. Combine the chicken, sauce (it may look like a little bit too much, but the chicken will absorb some of it! ), scallions & cashews and mix well. Ideally let this refrigerate for a few hours before serving to the flavors have time to get to know each other! Enjoy! This entry was posted in Chicken, Yogurt and tagged cashews, chicken, chicken salad, curried chicken salad, curry, healthy, Ina Garten, lunch, scallions. Bookmark the permalink.